At Blue Haven Pools, we know the positive impact a well-designed gunite pool & spa can have on your outdoor space. That’s why we are committed to offering stellar client service and inground pool construction expertise to homeowners in areas like Greater Harrisburg and throughout the Susquehanna Valley. Using only high-caliber materials and pool equipment for your pool project, we can build any size, shape, or style of gunite pool & spa. We create simple, budget-friendly designs, as well as elaborate custom projects. You can also include decorative touches ranging from sleek cascade water features to colorful in-floor mosaics of sea creatures or a sports team logo. You can also count on Blue Haven for an inground pool designed for maximum fun and minimal effort: Not only do we build a beautiful “liquid asset” you will be proud to show off, we also provide one that’s easier and more affordable to maintain. The reason why: Our time- and money-saving technology will make owning your aquatic retreat the affordable, fuss-free experience it should be. You can read here to learn more about Blue Haven’s exclusive SmartFeatures. Selecting a contractor to build your custom pool is a major decision. We encourage you to ask any pool builder you are considering for a complete in-home estimate and design proposal. Ask lots of questions—from the amount of time they have been in business to the details of their written warranties. Request photos of their recently completed projects as well. Get started on your new backyard oasis. Call for a free 44-page color brochure, no-obligation in-home estimate, and custom gunite poolscape by an experienced Blue Haven designer. 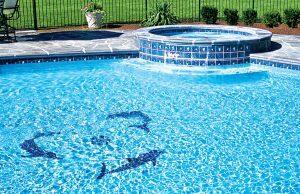 Vinyl liner pools: Why settle when you can have a real inground pool & spa? Your home was built to last, so your swimming pool should be, too! So why accept a vinyl liner pool when you have the option of building a lasting, beautiful gunite pool? 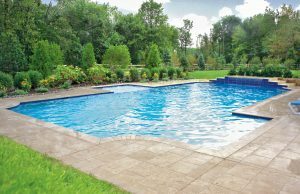 Along with being more affordable than you might have imagined, gunite pools are far more attractive and far more functional. The shape and design versatility that comes with these solid concrete-and-steel structures means you can enjoy an aquatic resort that enhances your home the way a permanent home improvement addition should. 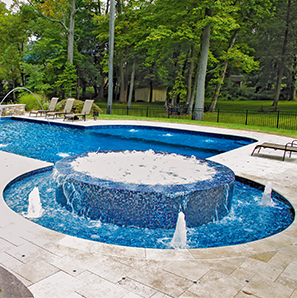 Unlike their vinyl counterparts, gunite pools provide extensive options for both style and features. For example, your builder can include a spa much more easily. Better yet, a gunite spa earns an A+ in the looks department; unlike prefabricated acrylic spa shells (to which vinyl-pool companies are limited to installing), gunite spas are visually appealing and create a lovely centerpiece to your overall poolscape. A gunite pool provides other options for functional and aesthetic features that are next to impossible with a vinyl pool. The most popular include swim-up bars and in-pool dining areas with integrated tables and seating. Another big favorite among Pennsylvania homeowners is a tanning ledge. Also known as a sun deck or Baja step, this integrated structure inside the pool can also include a built-in sleeve to hold a patio umbrella for shade. In addition, with a gunite pool, your pool contractor can seamlessly include sophisticated features like raised walls (“bond beams”) covered in tile or stone that add dimension to your poolscape. You can even have a stunning negative–edge design (aka “infinity pool”). If your yard requires a retaining wall, you may have the opportunity to build this structure as one side of your gunite pool. The result is a cohesive, distinctive configuration that cannot be replicated on a vinyl pool installation.